But apart from the sheer linguistic understanding, which was difficult, it really made no semantic sense. I doubt that it was supposed to, but it did make watching this film extremely hard. Sokurov is obviously a very talented film maker and he still managed to evoke a strong atmosphere for the film. But I have to admit that his constant switching between (yellow tinted) black and white and color shots (in no discernible system) bothered me. But I just can’t get over how little sense this film made. And I believe that this movie would have lost nothing but gained everything if it had made at least a little sense. I kept hoping that it would, but it just got weirder and more annoying. Summarising: The only thing I got from it was frustration. Maybe I’m not artsy enough to appreciate this film, so be my guest to try whether you get a different result. I doubt it, though. *Which reminded me of the two times I was in the cinema while I was in Russia: First, I saw the Barber of Siberia and the parts that were in English were dubbed into Russian, but the original sound was still there, which was already quite confusing. But then I saw The Perfect Storm which used basically the same procedure, but only one guy who spoke all the lines which was extremely disconcerting. ** Maybe that kind of dubbing/sound editing is a Russian thing. **It might have been the other way round with the Barber having only one guy doing all the talking and the Perfect Storm more. I have to admit, it’s been more than ten years since this happened and I’m fuzzy about the details. But I know for sure that for one movie it was that way. 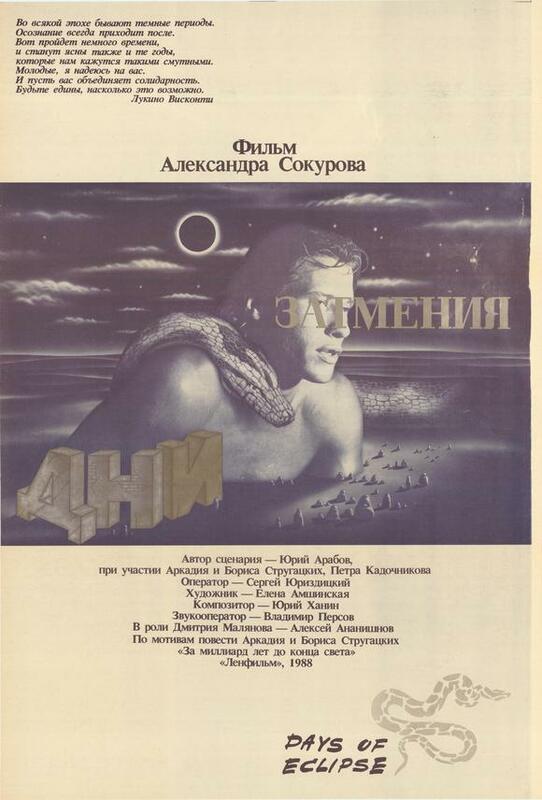 This entry was posted in movies and tagged 1989, A Billion Years Before the End, Aleksandr Sokurov, Aleksei Ananishnov, Arkady Strugatsky, Boris Strugatsky, Days of Eclipse, Definitely Maybe, Dni zatmeniya, Eskender Umarov, Filmmuseum, Vladimir Zamansky, Za milliard let do kontsa sveta by kalafudra. Bookmark the permalink.